The Michigan Department of Transportation (MDOT) recently approved the popular ���RV Friendly��� highway signs that tell recreation vehicle (RV) enthusiasts which roadside gas, food, lodging and camping facilities easily accommodate RVs including motorized and towable units. This approval follows closely on the heels of the Texas Department of Transportation adopting the RV Friendly signs and adds considerable momentum to the initiative. The RV Friendly logo���a bright yellow circle with the letters RV���alerts RV motorists of facilities adjacent to highways that cater to the special needs of RVs at specific highway exits. When RV Friendly logos are included on the logos of qualified establishments, motorists know those businesses have parking facilities capable of accommodating RVs. Motorists driving or towing RVs can have difficulty identifying and locating restaurants, gas stations and tourist attractions that have parking spaces and other amenities to easily maneuver their vehicles. Faced with the desire not to get into a tight spot, RV motorists may bypass destinations and businesses where they could have been well accommodated. ���The RV Friendly initiative supports the industry by making the RV experience more convenient and enjoyable. And like in Texas, we were able to get it accomplished by working with MDOT rather than having to pursue legislation,��� added Sheffer. Michigan is the seventh state to adopt the RV Friendly road sign initiative, joining Oregon, Louisiana, Tennessee, Washington, Florida and Texas. RVIA���s goal is 50-state implementation of the symbol. RV Friendly legislation is currently pending in Alabama and Mississippi. RV ownership has reached record levels in the United States with an estimated 30 million RV enthusiasts. On America���s roads today are 8.2 million RVs, which include motorhomes, travel trailers, folding camping trailers, truck campers and sport utility RVs. That���s nearly one RV in every 12 vehicle-owning households in the United States, according to a 2005 University of Michigan study. RV travelers spend substantial amounts of money on food, clothing, souvenirs and entertainment in the communities that surround campgrounds. A 2004 Woodall���s/ARVC RV Park and Campground Survey estimated that more than $3.8 billion was spent by RVers and campers in local communities as they visited the nation���s commercial RV parks and campgrounds from Memorial Day to Labor Day. RV owners use their vehicles an average 26.3 days annually, according to the University of Michigan study. More than two-thirds of RVers take spur-of-the-moment trips year round, using their vehicles to support a wide range of recreational activities and interests, from camping, fishing, hiking, biking and boating to antiquing, horse shows, tailgating at sports events and outlet mall shopping. 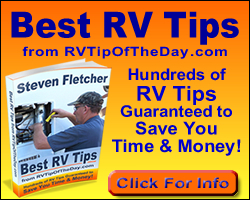 Today���s typical RV owner is 49 years old, married, with an annual household income of $68,000���higher than the median for all households, the same University of Michigan study found.